"This seasoning is a staple to have in a Puerto Rican kitchen, but sometimes hard to find where I live. So I started making my own and it's good! Great seasoning for just about anything; my boys love to shake it on fries. Enjoy!" Whisk garlic powder, salt, black pepper, oregano, and turmeric together in a bowl. Store in an airtight container. If you have a coffee grinder, grind garlic powder, salt, oregano, and turmeric together. Stir black pepper into mixture and store in an airtight container. 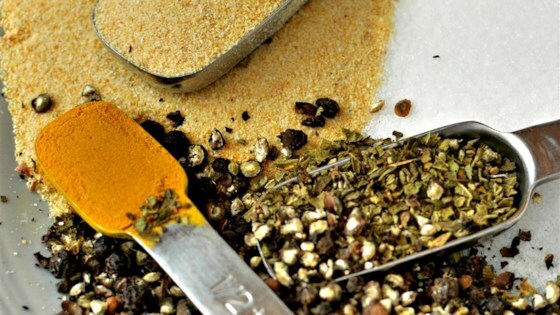 A good versatile seasoning that can be adjusted to lower the sodium. You can put this on just about anything. This worked perfectly in a recipe that called for adobe seasoning. It is nice to be able to adjust the flavours to our liking. Thank you PR Punisher for the recipe. Delicious! I cut down the salt to 1 tbsp and it was perfect! Amazing recipe! Kids even love it! Bye bye Goya! I am officially out of the adobo buying business. I ran out and tried this recipe; it was super easy and delicious. ?? Loved it, used it recently with a batch of grilled chicken and Puerto Rican inspired beans and rice, arroz con habichuelas. It becomes a staple in my pantry now. I used it when I made the Cuban Ropa Vieja dish!